If you hear a loud noise and see some broken glass, it might be me throwing my sewing machine out the window. Tuesday afternoon I saw Mique's 30Days post about making these delightful ruffle scarves. Right away I knew it was something I had to try. Like that afternoon. Immediately. Well, as immediately as right after picking Annelise up from school and stopping at Hancock Fabric on the way home. I found some pretty turquoise knit fabric, but it wasn't jersey knit like the tutorial called for, it was interlock. Does that matter? This, I do not know. I asked the ladies at Hancock about elastic thread, which is required. This, they did not know. After whipping up one of my favorite easy go-to meals (taco soup) for supper, it was time to get down to crafty business. Soon the strips were cut, the Singer threaded, the moment of truth arrived. Whirr...stitch...snip. No scrunchy ruffles. Looks like elastic thread could NOT be skipped. The crafty muse was in full force, I had to find elastic thread that. very. night. I called Jo-Ann's and asked the young girl if they sold elastic thread. This, she did not know. Guess what? They DID sell elastic thread, which is conveniently located near the elastic. I resisted the urge to smugly ever so politely tell the girls this fact, which was hard. Since I was already there, I also got a couple more yards of brightly knit fabric because I had big plans to make loads of ruffle scarves for gifts. Now it's Thursday. How many ruffle scarves have I made? I take that back. I have one tester scarf and one that I thought was going to ruffle. See? As it turns out, elastic thread is a wily, temperamental beast. I either get the tension too tight so there are no ruffles or the tension is too loose, creating ruffles (yea!) but they fall out as soon as you move the scarf. Seeing as scarves are meant to be worn, this could pose a problem. Are ruffle scarves in my future? This, I do not know. Don't worry, I'm not giving up. I won't let the elastic thread beat me. I won't. Um...any one have any tips? Oh I WISH I could sew! But that scarf does look so pretty - the turquoise next to your orange pumpkin-- if that helps any! My only tip would be....hurry to shopping purgatory and buy the scarves. I'm afraid I might be with Lynn on this one! I have seen some adorable ruffle scarves! Just kidding. I didn't mean to sound demanding. So I'm adding, "Please will you send me a scarf?" I'll trade you for...for...hmmmm...I have no talents. I feel this way every time I attempt to sew, so I've pretty much given it up except for minimal straight-line sewing. 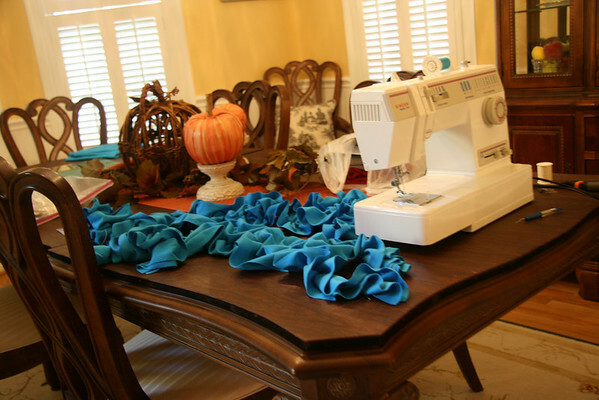 Your scarf appears to have ruffles while sitting on the table. Crystal: I WOULD love to send you one girl, once I figure out the ruffle problem. Jill: I know! These ruffles are deceptive. They appear--and then they fall out because the stitch tension is too loose. I'm obviosly doing SOMETHING wrong, but not sure what. The tutorial looks soooo easy. This was supposed to be EASY! !